Since we upgraded to Power BI Report Server (https://blog.volkerbachmann.de/2017/11/08/upgrade-sql-server-2016-reporting-server-to-sql-2017-and-pbi-rs/) there are problems with paginated Reports that have an Apostrophe (‘) in the file or foldername. Because we use it for french reports, there were some reports where this is used. The problem arises when one needs to manage or change the report. Execution works normally. Seitdem wir auf den Power BI Reporting Server (2017) upgegradet haben (Link zu dem Artikel oben), gibt es Schwierigkeiten bei der Verwaltung von seitenbasierten Berichten die ein Apostrophe (‘) im Namen oder dem Ordner-Namen enthalten. Diese lassen sich aktuell nicht anpassen, es sei denn man nennt den Report oder den Ordner um und entfernt dabei dieses Sonderzeichen. In der Power BI Community existiert ein Issue Eintrag dazu. Es besteht die Hoffnung dass der Fehler in Kürze behoben wird. I’m still using the free dbWarden Monitoring Scripts for an easy basis monitoring of our SQL Server Environment. Links to the orignal documentation is at the bottom of this short blog article. With SQL Server 2017 there is a new change neccessary for the Health Report to run properly. It’s nearly the same point that I described on January for SQL 2012 and above (german only). The Replication Helper procedure is changed and need aditional parameters. The two fields (deletebatchsize_xact and deletebachsize_cmd) needs to be added to the temporary table definition before the insert command can be executed without error. This all is found in the Stored Procedure rpt_HealthReport which is called by the Agent Job Health Report. Ich benutze immer noch die kostenlosen dbWarden Monitoring Scripts für eine einfache Überwachung unserer SQL Server-Umgebung. Links zur Originaldokumentation finden Sie am Ende dieses kurzen Blog-Artikels. Mit SQL Server 2017 ist eine neue Änderung erforderlich, damit der Health-Bericht ordnungsgemäß ausgeführt werden kann. Es ist fast derselbe Punkt, den ich im Januar für SQL 2012 und höher beschrieben habe. Die Replication Helper Prozedur sp_helpdistributor wurde geändert und benötigt zusätzliche Parameter. Die beiden Felder (deletebatchsize_xact und deletebachsize_cmd) müssen der temporären Tabellendefinition hinzugefügt werden, bevor der insert-Befehl ohne Fehler ausgeführt werden kann. Dies ist in der Store-Prozedur rpt_HealthReport zu finden, die vom Agent-Job-Healt Report aufgerufen wird. after our reporting department discovered Power BI, our existing Reporting Server 2016 Enterprise (including SA) should be updated as soon as possible to the new SQL Server 2017 with Power BI Report Server. Environment: VM with Windows Server 2016 Datacenter plus SQL Server 2016 with integrated Reporting Server. Backup VM with Veeam Backup. Snapshot of the VM in addition to A. Backup of the report server key – very important !! Backup of the Configuration of the Report Server; take screenshots of each page. Backup the rs.config or better the whole MSRS13 directory. During the upgrade it is pointed out that the Reporting Server part will be uninstalled during the update. This must be confirmed with a hook! After the update the server needs a reboot. The SQL Server Reporting service and almost the complete directory MSRS13.MSSQLServer was gone afterwards – except for LogFiles and RSTempFiles. Install Power BI Reporting Server (Edition 10/2017). The serial number for the Power BI Premium Reporting Server on Premise can be found in the VLSC portal since we purchased the Enterprise SQL Server with SA. The configuration must be set up on the same database, URL, etc. as was previously the case with the Reporting Server 2016. After applying the URLs a warning comes up saying that the appropriate options existed already before and are updated now with the new attitudes. That’s OK and we move on to the next settings. After the activation of the previous settings, the PBIRS can be reached under the same URL, has all reports activated with the same subscriptions that were there before. The migration is now complete and you can now additionally upload Power BI reports to the new server. For communication with the server, an alternative PBI client is available with which Power BI reports can be uploaded directly from the client and loaded from them. Umgebung: VM mit Windows Server 2016 Datacenter plus SQL Server 2016 mit integriertem Reporting Server. Sicherung des Berichtsserver Schlüssels – ganz wichtig!! Sicherung der Konfiguration des Berichtsservers, am besten Screenshots der einzelnen Seiten anfertigen. Sicherung der rs.config bzw. des ganzen MSRS13 Verzeichnisses. Während der Aktualisierung wird darauf hingewiesen dass der Reporting Server Teil bei der Aktualisierung deinstalliert wird. Das muss zusätzlich bestätigt werden mit einem Haken! Nach der Aktualisierung war dann bei mir ein Neustart notwendig. 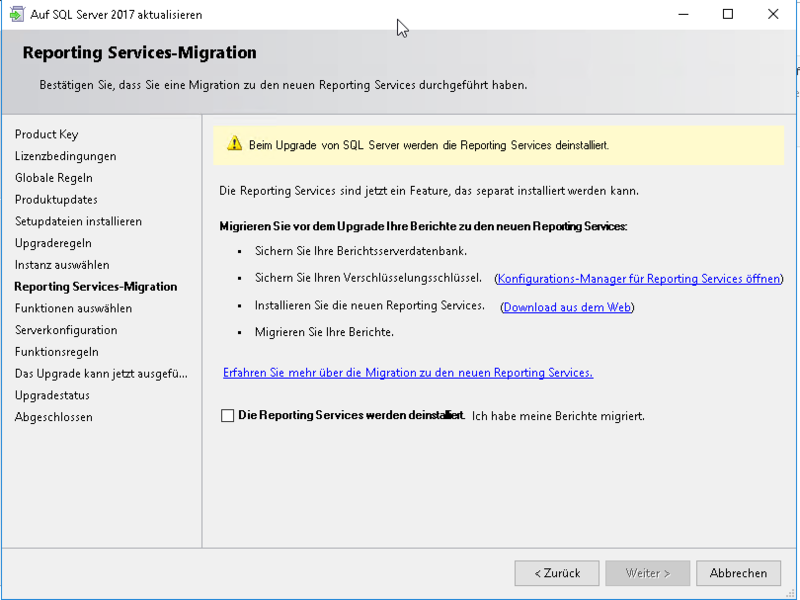 Der SQL Server Reporting Dienst und auch fast das komplett Verzeichnis MSRS13.MSSQLServer war danach weg – bis auf LogFiles und RSTempFiles. Power BI Reporting Server (Version 10/2017) installieren. die Seriennummer zum Power BI Premium findet sich für uns im VLSC Portal da wir den Enterprise SQL Server mit SA gekauft hatten. die Konfiguration ist auf die gleiche Datenbank, URL usw. einzurichten wie das vorher beim Reporting Server 2016 war. bei den URLs kommt bei der Speicherung der Hinweis, dass die entsprechenden Einstellungen vorher schon existierten und nun mit den neuen Einstellungen aktualisiert werden. Das ist OK und wir gehen weiter zu den nächsten Einstellungen. Nach der korrekten Aktivierung der vorherigen Einstellungen ist der PBIRS unter der selben URL erreichbar, hat alle Reports und Abos die vorher da waren auch wieder aktiv. Die Migration ist damit abgeschlossen und es können nun zusätzlich Power BI Reports auf den neuen Server hochgeladen werden. Für die Kommunikation mit dem Server ist ein alternativer PBI Client verfügbar mit dem Power BI Berichte direkt aus dem Client hochgeladen werden können und daraus auch geladen werden können. a compilation of all the PowerShell articles of the #PSBlogWeek 2017 is now available. Included is my article about “SQL Server Migration with PowerShell dbatools”. You’ll find Links to the original six blog articles on the activity Page from #PSBlogWeek. Thanks go out to all contributors and for Adam for hosting the event and for compiling the eBook. Migration of physical SQL Server to a new VMware Environment. As announced in my last post about Migration of SQL Server with PowerShell dbatools #PSBlogWeek I’ll write a recap of the first three parts of the project – and here we come. It all begun with the idea of reducing the amount of seven physical server we use for our SQL Server databases. old servers are running out of support and have to be replaced. the amount of SQL Server Core licenses can be reduced. better High Availability and shorter restore times in case of a Desaster Recovery. fewer unused ressources of the physical server. To analyze and select the hardware, we used a Dell tool (DPack) to record the performance data of the seven physical servers for over a week. We saw a peek there of 11.000 IOPS that needs to be fulfilled by the VMware Environment. But that’s only a peek and therefore considered as the maximum value. The mean at 95% is 2475 IOPS. Here is the (german) summary for the 7 servers with the determined data. It says we need 661 MB/s, or 11074 IOPS (2475 by mean 95%) for the seven server with 22 CPUs and 116 Cores. Therefore a selection of 3 Dell Poweredge servers (R730), two Dell 10G switches (S4048T) and two SANs (Compellent SC4020 with SSDs) was proposed as a central storage. For the VMware version, the Essentials Plus version is enough for us, as this will be a completely independent environment. Windows 2016 Datacenter with the correct core number serves as the operating system in the VMs. The SQL Server are licensed with SQL Server 2016 Standard incl. SA in the Core variant, a single one is raised to Enterprise 2016 for a Mobile Reports Reporting Server (SSRS). Unfortunately, one of the two SANs was canceled for the order due to financial reasons, which reduced the total price by about 50K. The lack of the SAN does not affect the topic of HA to any great extent, but is crucial for disaster recovery. In the event of a complete failure of the SAN, the mission-critical productive databases are no longer available on another SAN in a very short time, but must be restored from the backup. Here the goal of the shorter Disaster Recovery times is in my opinion again far off. This section will discuss how to configure the VMware environment that was run during the initial installation by a Dell Remote engineer. The three servers (Dell PowerEdge R730) each contain 2 CPUs with 12 cores, that is a total of 72 cores and 512 GB RAM each. There are two micro SD cards for the operating system in the servers (VMware 6.0 – 6.5 is not yet supported by the SAN). The Compellent SC4020 SAN has 9 SSDs of 3.82 TB each, one of which is configured as a HotSpare. The volumes are available as RAID 6 or 10. 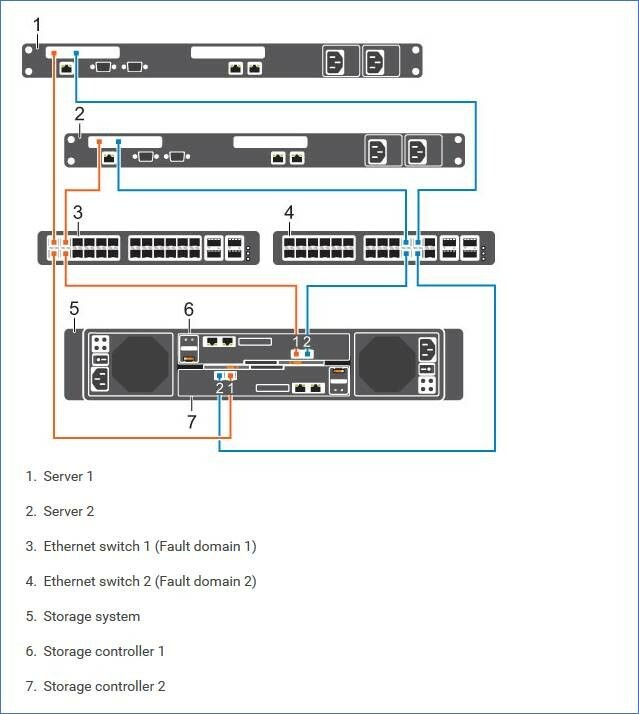 Server and SAN are connected via the Dell S4048T switches with 4 x 10G each. First, the physical installation of the environment was done in the data center. The problem arose that the switches were delivered without OS. So it was necessary for the switches and then the two controllers of the SAN to provide serial ports to the device. My colleague provided me with a 4-way serial to USB / network adapter based on a Raspberry. At the same time, FTP, TFTP and several other servers proved to be very helpful for the setup. At the same time, the servers and the SAN could still be reached via their management ports (Dell iDRAC), which was also necessary for the basic installation. 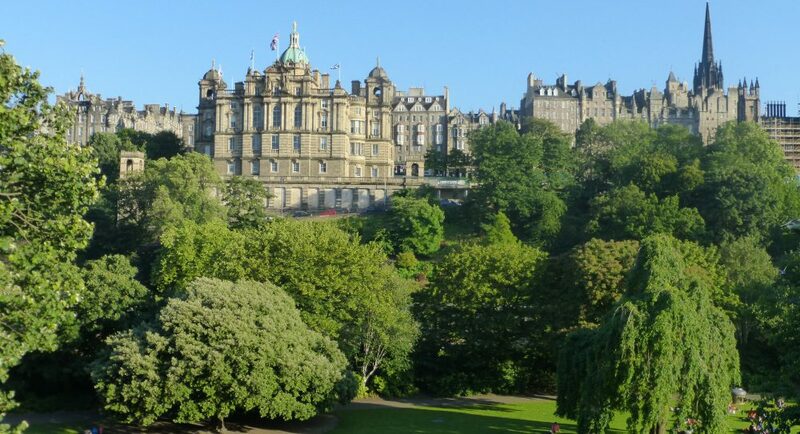 On the basis of the basic structure (picture below) you can see the architecture of the area well. At the top the two servers, including the two switches to which then the SAN is connected. Of course, everything is wired twice to achieve the greatest possible reliability. The environment shown in the picture differs from ours only that two servers are used here, but three servers are used in our environment as hosts. Of course, there are other internal connections between servers, switches and the SAN to separate, for example, VMware, VMotion, iSCSI and other traffic from the actual traffic to the rest of the network. Its connection is then made via two breakout cables with 4 x 10G which are connected directly to our central core switches. The basic installation was then carried out by the mentioned Dell Remote technician. During the subsequent tests of the various failure scenarios (switch, server, SAN controller) an error occurred during the reboot of one of the switches. Dell support has then replaced the switch directly. This section is now about the detail configuration of the individual virtual machines. This SQL Server VMware environment is now the third stand-alone VMware environment. Each environment consists of three ESXi hosts connected to one or two SANs. So far, in the second or “Application-VMware” called environment, we have not thought so much about the VMs and their possible performance requirements. But that changed with the introduction of this SQL Server on VMware environment, as we wanted to turn high performance productive servers from physics to virtual without sacrificing speed. Basically it was, as described in the beginning of the article, of course, the replacement of existing hardware with new – in the form of VMware Hosts. Behind it was, of course, in the implementation and the requirement that it should not slow down in any case. That’s why I’ve studied the requirements of SQL Server in such an environment and read various guides and best practices. These are available from Microsoft, VMware and several other sources (I have linked a part of them below). Particularly helpful was a series of articles by David Klee on the page sqlservercentral.com called “Stairway to SQL Server Virtualization” (1). The majority of the following settings / configurations is taken from this article because there, unlike the other sources, directly and understandably the most important points are highlighted and shown by example. Basically the same applies here as for physical hardware: distribution of access to as many disks as possible, or here SAN paths (LUNs). Since this is often the same target on the SAN, only distinguished by different RAIDs (6 or 10), the only noticeable difference is the buffer of each individual path (LUN). This also means that the correct RAIDs have to be passed through the different LUNs to the VM. Accordingly, hard disk configuration and allocation is as complex as in “physical life”. As mentioned in the article, it is also of particular importance to use the correct hard disk adapter, ie controller (see SCSI ID), not the standard but the Paravirtualized Adapters (Paravirtual SCSI Driver – PVSCSI). 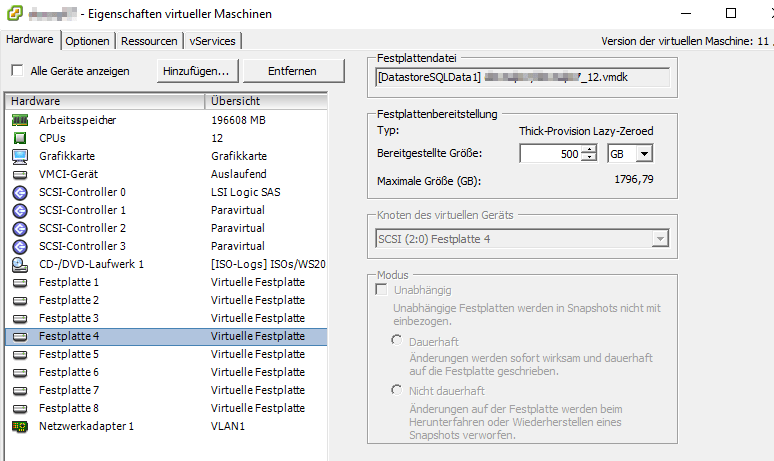 For partitions C: (OS) and Y: (Pagefile) in the table above, this can be left with the default LSI SAS Controller. The other should be set up on the mentioned PVSCSI. However, the corresponding controller and thus the drives are only present in the VM when the VMware Tools are installed. Unfortunately, the assignment of the hard disks to the appropriate controller now only works in the vSphere web client. The hard disk type used is fixed disk sizes (thick provision lazy-zeroed or eager-zeroed) as static VHDs. Although thin provision may be more economical in the beginning when consuming disk space, it will consume additional resources when the VMDK files are enlarged in the background because the space is needed. This is – similar to the autogrowth of a database – most often exactly the wrong time and then possibly causes problems in the VM. The CPU settings are also a bit more complicated. For the whole topic, note how many physical CPUs the ESX Host has the VMs on. This should be considered as the maximum that should be allocated in the VMs – an overbooking of the CPU resources, assigning more CPU than the host has available does not make sense for SQL Server. In addition, one could still consider in connection with the size of the memory (point 3) the subject NUMA (Non Uniform Memory Access). This means that accessing the memory directly allocated to a CPU is faster than accessing “remote” memory. To what extent this has an impact on the performance of the VMs, I can only estimate so far, as I have not received any information from Dell, which tells me the correct configuration of our servers used. The basic CPU settings are simply distributed between the virtual sockets (processors) and cores per socket (cores per processor). In the screenshot you can see that there are 12 cores associated with this VM, which then have to be licensed under current license conditions for the SQL Server (no guarantee!). The allocation of the necessary memory for a VM mainly depends on the size of the databases, which should be as completely as possible in the main memory for performance reasons. To add is still a share for OS and SQL Server itself. The screenshot above currently has 192 GB allocated. As already indicated in the case of CPU there are still missing technical details missing for the configuration. For the network, you should use VMXNET3 adapters, which also do not arrive in the VM until the VMware Tools are installed. Basically, there is still room for teaming two network adapters in the VM – not necessarily as a redundancy topic, but again with two additional buffers Speed ​​advantage – though probably minimal. That still needs to be tested. This point was later added by another document from Idera “Moving SQL Server to a virtual Platform” (6). For this reason, this is also not included in the original configuration. The entire configuration refers to the settings of one VM. Of course, the complete installation incl. SQL Server was finally migrated to a template to quickly create another SQL Server. • Set Powerplan to highest performance – in the VM as well as the ESXi hosts. • Performance comparison physical <-> virtual – to be done!